It is kitchen makeover time. Finally. - Lovely Etc. You are here: Home / Etc. / It is kitchen makeover time. Finally. It is kitchen makeover time. Finally. I wasn’t sure this day would ever come, but finally, finally we’re getting a new kitchen! Okay, not really. There is almost nothing actually new involved. 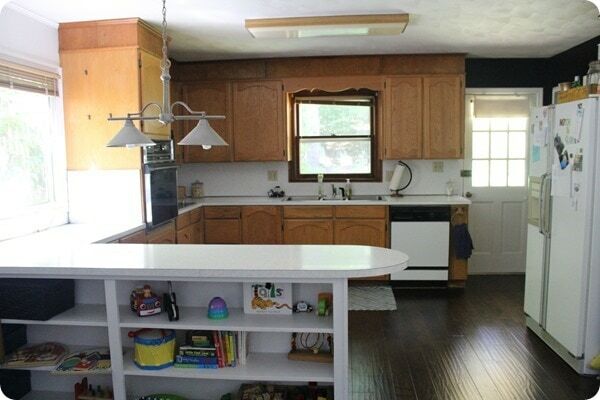 But our kitchen is about to undergo a massive transformation and I am so, so excited! This kitchen makeover is going to be a classic Lovely Etc. redo: lots of DIY, making do, and thrifting. And going right along with that is the fact that this makeover is going to be happening on a shoestring budget. As in teeny tiny. 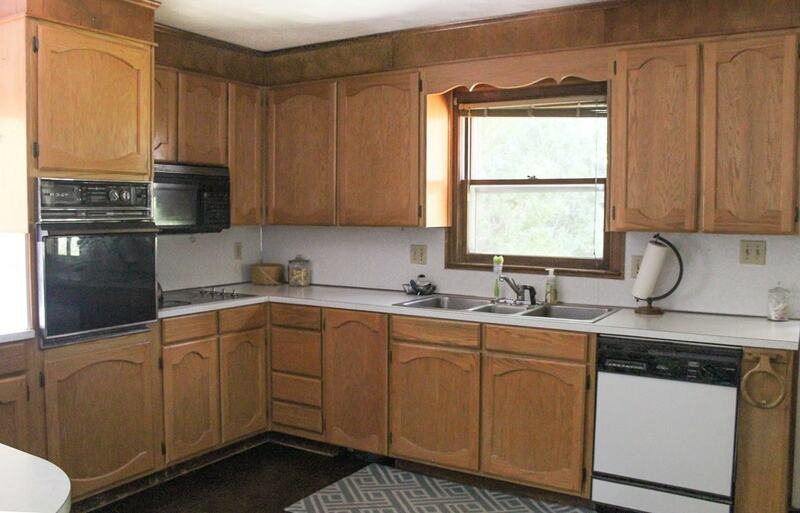 I’m planning for this entire kitchen to come in under $1000. This is how our kitchen looked after we moved in. We added wood floors a few years ago which made a huge difference, but other than that, pretty much everything needs help. Cabinets, hardware, backsplash, counters, appliances, lighting, window treatments, the whole enchilada. So how in the world am I going to make this happen? Well, first of all, the layout of the kitchen isn’t changing. Are there some changes that could potentially make the room better? Sure. But are there actual problems with the current layout? Nope. And while I know that most people approach a kitchen makeover as a chance to change anything and everything to be the absolute best possible, I feel like it’s pretty silly to change something that isn’t a problem. And it is even sillier to spend a ton of money to do it. I’m going to be working with what I’ve got and making it beautiful. There will be lots and lots of paint involved. And I will be stalking Craigslist like it’s my job. And yes, that little country flourish over the window is finally going to go. Hallelujah! All of which means this isn’t the kind of makeover where I can share a detailed plan right from the start. When you’re working on a shoestring budget and dependent on Craigslist, you can’t know ahead of time exactly what you are going to find. So I don’t have a nifty moodboard to share. But I can tell you that what I am going for is light, bright and classic with a hint of fun. Did I mention I’m excited! Do you have any kitchen makeover wisdom to share? I’m definitely up for hearing any money saving ideas you’ve got! I’m with you! 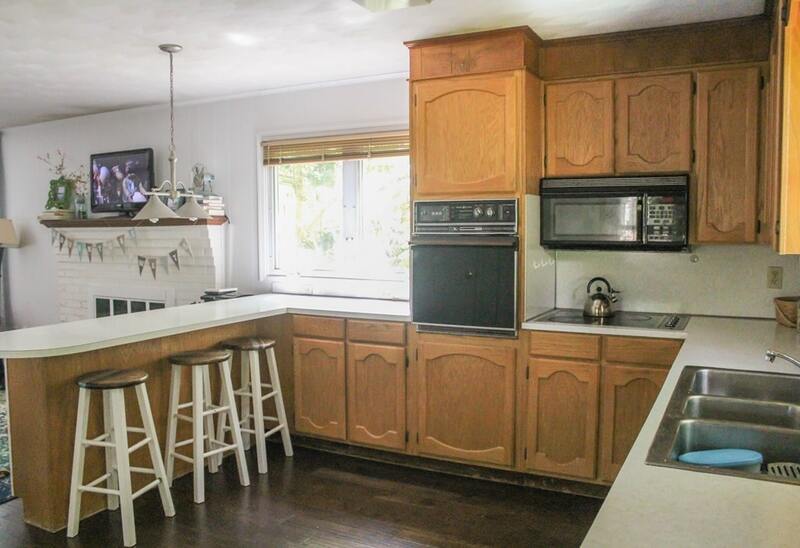 I’ve been wanting and needing a kitchen remodel from day one! After moving into our new home in 1976 it was too late to reslize the oven and fridge were in the path of entering and exiting the kitchen! Oh well. Maybe someday this will find a fix. I’m happy for you and totally get the “shoestring budget” wishing you all the best. Thanks so much Mary Lou! It seems like we never realize what things are problems until we live with them for awhile. Thanks for subscribing! We had the same soffits at our house! We ended up taking them off gently & moving the crown from the ceiling to the top of the cabinets. Adding rope lights behind the crown on a dimmer really added a high end look inexpensively. Saving the trim saved us from trying to match our old, but solid cabinetry! Reuse is such a great way to save money, but scattering around just a couple small, special touches to freshen up the look really made a difference at our house. Hope our experience helps! Thanks for sharing Amy! That is such a smart idea. And you are right – even when you are reusing most things, just a few special touches can really bring everything together. Carrie, I just spent my summer completing a kitchen cabinet paint job but of course, everything else needs redoing as well. 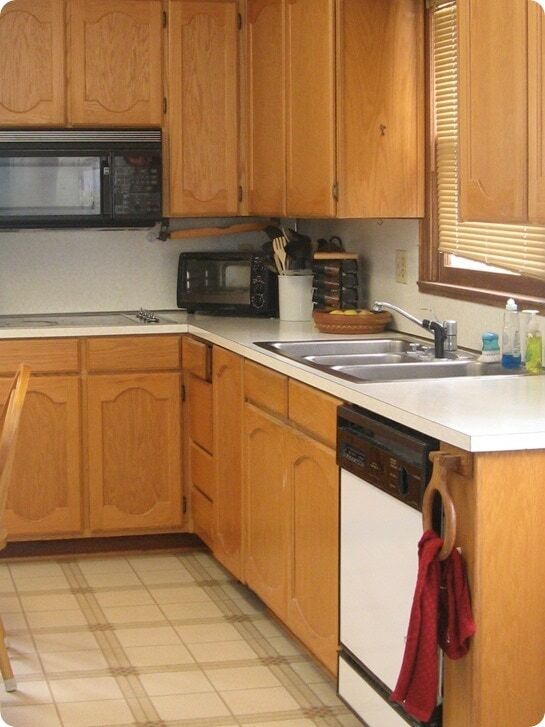 I can be persuaded to paint my countertops but one area is badly damaged and gouged. Ideas? Hmm, the gouges can definitely be filled in before painting, I’m just not sure what product would be best for that. You would need something durable so if there isn’t anything specifically for countertops, I would maybe look for something for floors.